One of the most important components of outdoor ethics is to be considerate of other visitors. It helps everyone enjoy their outdoor experience. Many people come to the outdoors to listen to nature. Excessive noise, unleashed pets and damaged surroundings take away from everyone’s experience. So, keep the noise level down while traveling and if you bring a radio, tapes or CDs, use headphones so you will not disturb others. Also keep in mind that the feeling of solitude, especially in open areas, is enhanced when group size is small, contacts are infrequent and behavior is unobtrusive. To maximize your feeling of privacy, avoid trips on holidays and busy weekends or take a trip during the off season. Groups leading or riding livestock have the right-of-way on trails. Hikers and bicyclists should move off the trail to the downhill side. Talk quietly to the riders as they pass, since horses are spooked easily. Take rest breaks on durable surfaces well off the designated trail. Keep in mind that visitors to seldom used places require an extra commitment to travel quietly and lightly on the land. When selecting a campsite, choose a site where rocks or trees will screen it from others view. 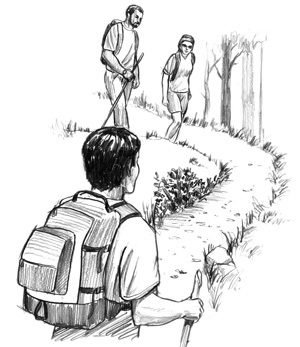 Keep noise down in camp so not to disturb other campers or those passing by on the trail. “Goofing off” or “pranks” are undesirable social behavior and may lead to serious or fatal injuries. Also “events” need to fit the setting – save game playing for the city park. Bright clothing and equipment, such as tents can be seen for long distances are discouraged. Especially in open natural areas, colors such as day-glow yellow are disturbing and contribute to a crowded feeling; choose earth-toned colors (ie. browns and greens) to lessen visual impacts. Keep pets under control at all times. Bowser is not in the wildlife category. Dogs running free can be unwelcome, frightening people or leaving behind unwanted “presents”. Please pick up dog feces from camps and trails. Some areas prohibit dogs or require them to be on a leash at all times.